Home » 30YR US T-Bonds : The Big Long – Is it over? One of the most enduring, if not the most enduring, trends in the financial markets has been the run of the 30 year US Treasury bond. From its low in September 1981, T-Bond have been on a relentless 35 year uptrend, almost linear in nature. The chart below is a monthly chart of the back-adjusted continuous futures contract. The price action has been well contained within its ubiquitous constant-width dominancy envelope for almost thirty years. The indicator at the bottom of the chart is tracking the rate of change of the underlying trend as measured by the dominancy envelope. As can be seen, the momentum is waning considerably. Will the coming round of interest rate increases finally turn the long term trend down? A filter analysis of long term interest rate data (inverse of bond prices) dating back to the 19th century reveals the same consistency and cohesiveness of price waves found in the U.S. stock indices, albeit a different average frequency. The bond prices exhibit certain spectral characteristics (i.e. 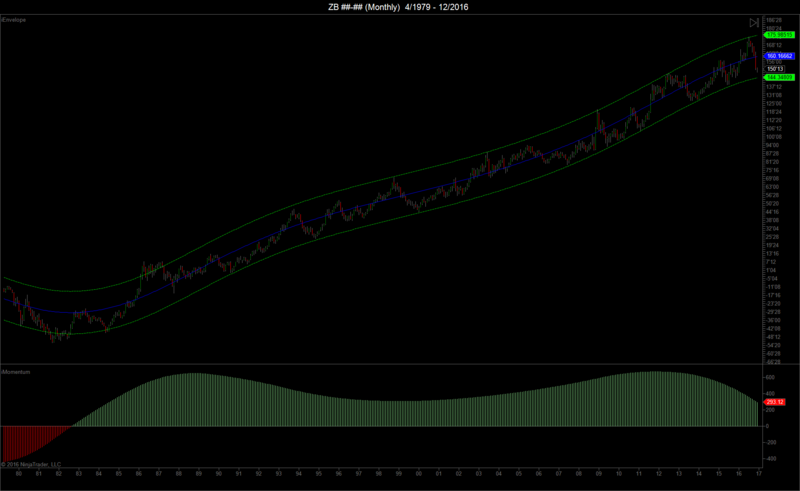 moderate amplitude modulation) that make them very suitable for cyclical trading. My retirement plan is now clear. If bond prices start trending down with the same consistency as they exhibited in the uptrend, upon reaching full retirement age, I’m using my Social Security check to short bond futures for the rest of my life! 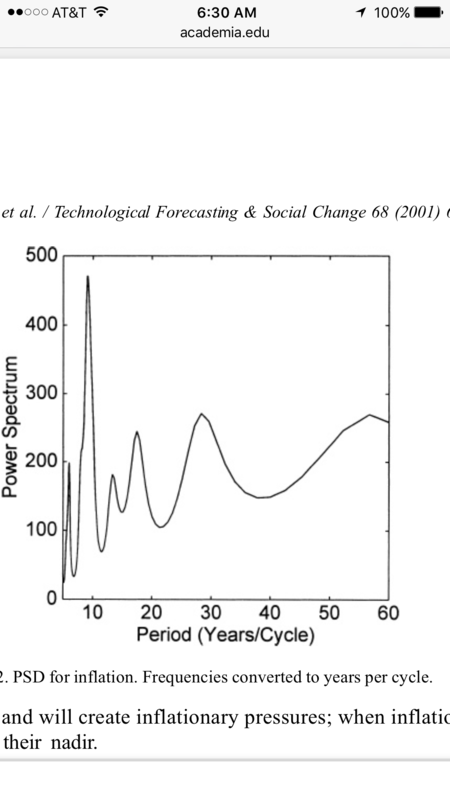 Below is the power spectrum for inflation over the last 250 years that I recently found in an academic paper (email me for details). 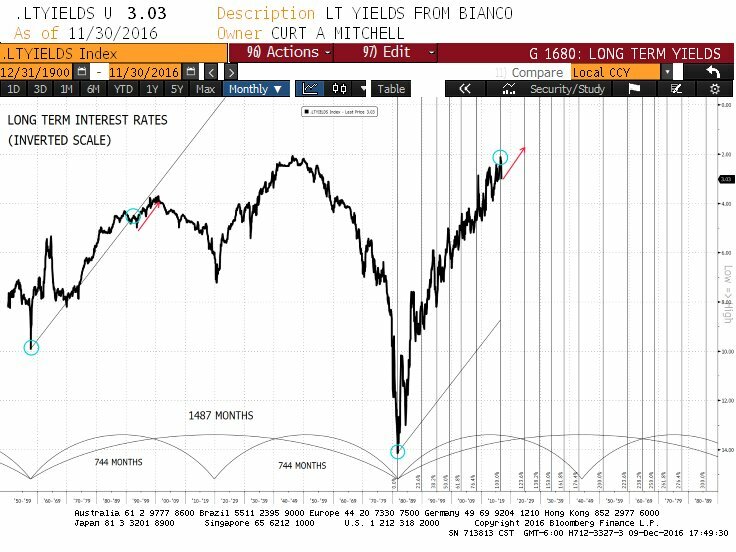 To the extent inflation and Treasury bond yields move in lock-step, these cycles should also work nicely for Treasuries. The 9, 18, 28, and 56 year cycles are broadly consistent with the work John (Silent One) did back in Jan, 2015 on this blog. You will also recognize some of the cycles from the Hurst Nominal Model. This makes sense as the waves of inflation and deflation in the economy (and subsequent monetary policy and interest rates) have a significant impact on stock prices in the long run. 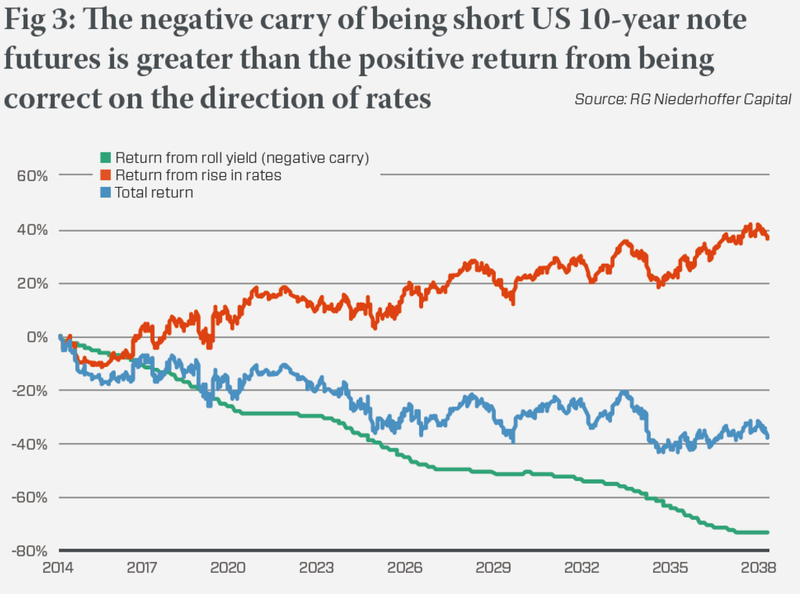 As someone who trades bonds for a living (and other instruments as a hobby), understanding the long-term direction of this trade will be critical to future success across a variety of asset classes, including currencies. I agree this Treasury bond bull market is very long in the tooth but need to do more work do determine how much if any room is left to the downside in yields. One thing that is inconsistent with the end of the bond bull market is that the default analysis for the Hurst nominal equity model calls for an 18 year low around 2020. Normally, this would coincide with a trough in business activity (recession) and falling prices and Treasury yields. All I can say at this point is watch those long-term bond FLDs closely. Regarding your retirement strategy, be careful what you wish for. Given the enormous sovereign debt loads globally, a dramatic rise in inflation and bond yields could severely impact many governments’ ability to pay. This does not even consider our President-elect’s cavalier attitude toward debt restructuring given his six prior bankruptcies! I finally got my hands on some good long-term interest rate data. There may still be some upside in bonds. If this cycle peak is as right-translated as the first k-wave in the last cycle (a big if), bonds could top out around 2024. This is the next projected major trough in stocks. The start date on the above chart is 1850 not 1900. 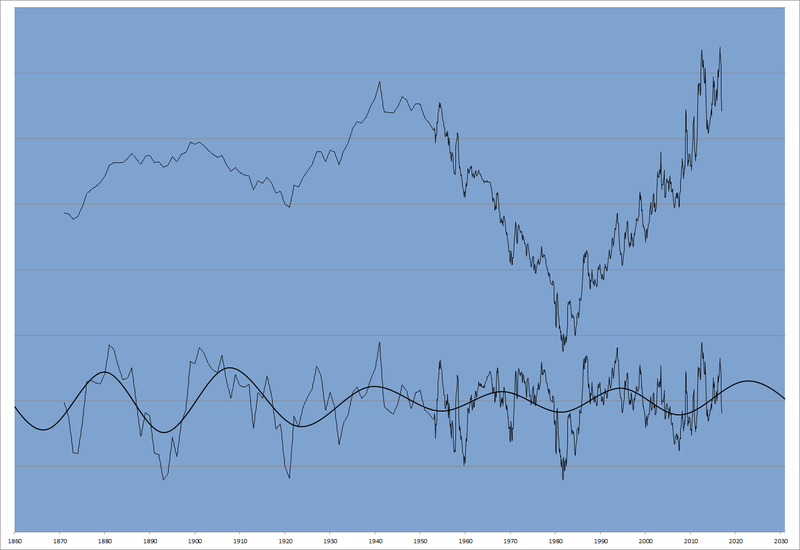 Attached is my chart of the inverse long term interest rate data. I didn’t have enough data to accurately pull out that 62 year wave but I was able to extract the wave that is 1/2 of that. I extrapolated it into the past and it corresponds fairly well with your chart. I don’t usually put much emphasis on those super long waves since their net effect is included in the highpass band of the shorter wave filters or the center line of a dominancy envelope. I can’t make out those vertical lines on your chart very well but I also have an intermediate length wave that has been very consistent over the last 60 years. It is currently forming a trough. A lower high of that wave will be my first indication that the 35 year uptrend may be terminating. I thought the return math in this piece was interesting. A vast majority of return from the bond bull market over the past 30 years was from carry. Shorting bonds continuously in a bond bear market is a negative carry trade which is not nearly as profitable even if your timing is perfect.